HomeWhat if Cleveland hadn’t won the 2014 NBA Draft Lottery? What if Cleveland hadn’t won the 2014 NBA Draft Lottery? April 21, 2015 April 21, 2015 Chris McGlynn Basketball, Draft, NBAAndrew WIggins, LeBron James, What if? The NBA draft lottery is always difficult to predict. The last time the team with the highest chance of winning the lottery landed the top pick was over a decade ago when the Magic won back in 2004. That pick turned into Dwight Howard and drastically changed Orlando’s fortunes for the next several years. Some teams have simply gotten lucky with the draft lottery. Cleveland ended up with the top pick in the draft three out of the past four years, including 2014, where the Cavs won despite only having a 1.7 percent chance. That is simply unprecedented. It makes you wonder what might have happened if the Cavaliers’ fortunes weren’t so great. Here is what would have happened if the Cavs did not win the 2014 NBA draft lottery. First thing is first, Andrew Wiggins doesn’t go first overall anymore. Milwaukee wins the draft lottery instead and the Bucks made it clear they wanted Jabari Parker no matter what. 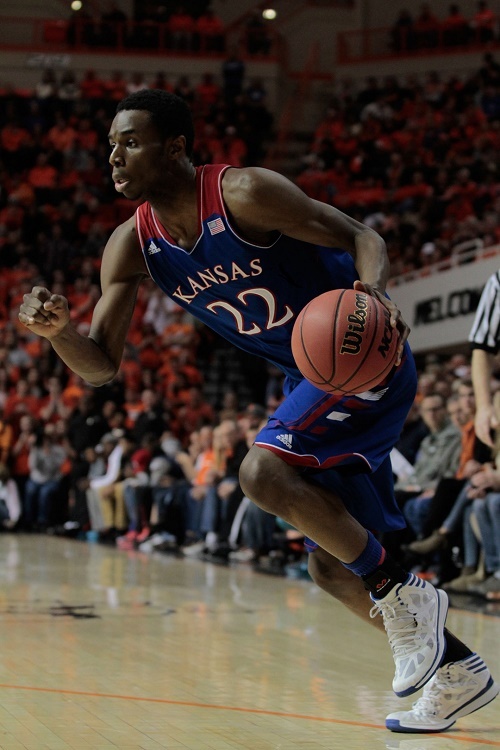 Instead, Wiggins goes second overall to the 76ers, making Philadelphia a scary young team. What transpires after the draft drastically changes the outlook of the 2014-2015 NBA season. With no elite bargaining chip, the Cavaliers are unable to pry Kevin Love from the Minnesota Timberwolves. Instead, Love is shipped to Boston in exchange for Marcus Smart, Rodney Hood and two future first round picks. With Love headed for the Celtics instead of the Cavaliers, LeBron James decides to opt into his contract with Miami. The King’s presence in South Beach means that Chris Bosh walks away from the Heat for a contract with the Houston Rockets. Bosh teams up with the aforementioned Howard and James Harden to form a new Big Three in Texas. Some other free agents change their decision as well. Pau Gasol joins Miami to fill Bosh’s void. The incredible amount of spending by the Heat means they cannot afford to add the young Hassan Whiteside, who instead joins Philadelphia now that Joel Embiid is not in the picture. And with Gasol bound for Florida, the Bulls hang on to Jusuf Nurkic rather than trade for Doug McDermott. Chicago also finds an incredible amount of cap space they use to lure Carmelo Anthony away from New York. The season starts with plenty of crazy headlines. Orlando cannot wait to pair Embiid with Nikola Vucevic next season. The 76ers love their core of Michael Carter-Williams, Nerlens Noel and Andrew Wiggins and never send MCW to Milwaukee. Rajon Rondo could not be happier in Boston with another star present in the form of Love. Dallas is in desperate need of a point guard but with Rondo locked in for the Celtics, the Mavericks find themselves out of luck. Right around the trade deadline, with the playoffs essentially out of sight with Dallas, Oklahoma City and New Orleans all in front of them, Phoenix deals Goran Dragic to the Knicks in exchange for Tim Hardaway Jr. and Lance Thomas. The Suns also send Isiah Thomas packing but this time to Charlotte for Lance Stephenson and a couple of future picks. When the playoffs roll around, the super teams in each conference, Miami and Houston, enter as the top seeds. Milwaukee and Dallas miss the postseason due to the trades that now never happen. The Heat matches up with the eighth-seeded Cavaliers in the first round as LeBron inflicts even more pain on Cleveland with a 4-0 sweep. Miami edges the fourth-seeded Celtics and beats out the talented Bulls for a return to the NBA Finals for a fifth straight year. They meet the Memphis Grizzlies after the Griz outlast Houston in the Western Conference Finals. Pau and Marc Gasol become the first brothers to face each other in the NBA Finals. It would be the elder Gasol who gets the last laugh as Miami snags its third title in five years. The following offseason, with his contract up and three rings to his name, James walks away from the Heat and joins the Cavaliers. Linking up with Kyrie Irving, James sets out to recruit either LaMarcus Aldridge or Marc Gasol to join him in Cleveland. Minnesota is still sitting with the worst record in the league after an atrocious 11-71 season. The Knicks and Lakers both join the Wolves as those among the bottom three in the league. All of this happens if a different ping-pong ball was picked back in May of last year. Instead of talking about Cleveland, all the hype would still be in Miami right now with the playoffs just getting underway and the MVP conversation would likely be over as James dominated the league once again. Who knows, maybe LeBron will still get that third ring anyway. As a T-Wolves fan I’m really glad the Cavs did win the lottery. I never thought about this before. I personally love Marcus Smart but he wouldn’t play well next to Rubio… and with Rubio’s injuries this year, he might have lost his job to Smart and be heading out of town at this point. Good article. Would be awesome if you could explain some of the free agent moves a bit more, why would Bosh leave Miami? and Why would old Gasol join? Where does Embiid go? and how how does memphis outlast Houston, with a big three of Harden, Howard and Bosh? Very interesting though. Well Bosh leaves because Houston offered him a max contract. With LeBron still on the books, Miami cannot afford to match the offer from the Rockets. Pau Gasol join the heat because Bosh’s departure creates a void at power forward and Gasol wanted to join an elite team in the East. Memphis wins though in the Western Conference Finals because Marc Gasol and Zach Randolph would wear down Bosh and the still recovering Howard. Plus I don’t think the Rockets would have an answer for Mike Conley and Courtney Lee. Good piece. It certainly makes you think.